Love them or hate them, Mumford And Sons have carved a nice little niche out of the mainstream for themselves and show no signs of going anywhere anytime soon. That said, just because they’re super popular these days does not mean they don’t have a sense of humor about the oddity that is their rise in fame over the last few years, and those needing proof need look no further than the video contained in this post. If you have seen one Mumford And Sons video it stands to reason you’ve essentially seen them all. The group usually appears looking like they fell out of a televised special on the depression, only with nicer beards, and are usually seen with their instruments strapped to their bodies. The new video for “Hopeless Wanderer” is no different in that aspect, but the stars of the show are a completely different story. 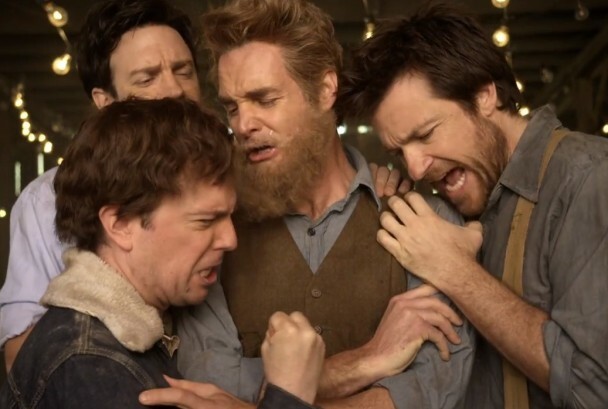 Jason Bateman, Ed Helms, Jason Sudeikis, and Will Forte have taken the place of Mumford and Sons, and their impersonation of their over-emotive style could not be more dead-on. You can view the clip below. Mumford And Sons released their extremely well-received Sophomore effort Babel just under a year ago, and have yet to end their promotional run. We know not when new music from the group will surface, but rest assured we’ll update you as soon as more information becomes available. Be sure to follow UTG on Twitter to ensure you never miss another headline. Tears ran down my cheeks the first time I watched this. Jason Sudeikis cracks me up like no other.